Pistachio Cardamom Pound Cake, the name has it all. This cake is a heavenly combination of the sweet-floral note from the cardamom and the nutty texture form the pistachios. I have never added cardamom to a cake before and i was totally surprised. Give this cake a try and you will definitely fall in love with the flavors. Preheat oven to 325°F. Prepare a 9x5inch loaf pan by greasing the bottom and sides with cooking spray and dust with flour. In a medium bowl sift together the flour, baking powder, salt and set aside. In a bowl of an electric mixer, fitted with paddle attachment cream butter on medium high for 5 minutes.Gradually add sugar and continue to cream for about 3 minutes until the mixture is light and fluffy. Scrape down the bottom and sides of the bowl for even mixing. Reduce the speed to low and add eggs one at a time, mixing well after each addition. Add the flour mixture alternating with the heavy cream and ground pistachios in three additions. Do not over mix. Add the batter to the loaf pan and smooth the top with a spatula. Bake for about 1hour and 15minutes. The cake should be golden brown and tooth pick inserted should come out clean. Let the cake cool in the pan for 20 minutes and then transfer to a wire rack to cool completely. Oven time may vary, so keep an eye on the cake close to 1hour mark. If the cake starts to brown on top before its cooked through, loosely cover on top with a foil and continue to bake. If you dont prefer cardamom powder, replace it with 1 teaspoon of vanilla extract. I have always liked chettinad cuisine for its spiciest curries made with freshly ground masalas. This egg is curry is one among them and the freshly ground spices makes the curry very aromatic. There are so many other versions of chettinad egg curry but most of them are prepared using more or less with the same basic spices. Egg curry is one of the easiest, when you are left with no options on what to make for lunch or dinner.It goes well with rice or roti. Place eggs in a pan and cover with cold water, eggs should be immersed completely in water. Bring the water to a rapid boil, then immediately remove from heat, cover and let it rest for exactly 10 minutes. Drain the water, roll the eggs around to crack the shells, then fill the pan with cold water and allow to stand another 5-10 minutes. Peel the shells and make a small slit lengthwise and keep aside. In a pan on medium heat dry roast the spices given under TO ROAST & GRIND until the spices are lightly toasted, add the coconut at last, mix well and remove from heat. Once the mixture cools down, grind them into a fine paste by adding water. Heat oil in a pan over medium heat. When oil is hot, add the mustard seeds and wait for it to splutter, add the cardamom pods, bayleaf and crushed garlic, stir gently. Add in the onions, curry leaves and green chili. Salute until the onions are soft and fully cooked. Add the ground paste along with turmeric powder and chill powder. Mix well and cook until the masala releases oil on the sides of the pan. Add the tomato paste and cook for few minutes. Add water and salt, mix well. Cover with a lid and let the mixture boil for 5 minutes. After 5 minutes, add in the eggs. Check for salt. Leave the lid open and let the curry boil for few minutes until it thickens to desired consistency. Garnish with coriander leaves and serve over rice. The amount of dry chili and chili powder given can be adjusted according to the spice level you prefer. I haven't specified the amount of water for the curry. It depends on how thick you want the curry to be, so add it to your preference. 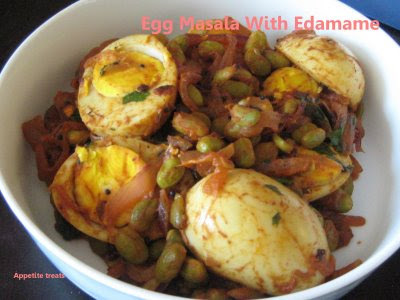 A delicious and spicy egg dish that can be put together in no time, perfect to pair with rice, roti or pulao . We had it for our sunday brunch with some bread toasts. You can also serve it as an party appetizer. To prepare hard-boiled eggs, place eggs in a pan and cover with cold water. Eggs should be immersed completely in water. Bring the water to a rapid boil, then immediately remove from heat, cover and let it rest for exactly 10 minutes. Drain the water, roll the eggs around to crack the shells, then fill the pan with cold water and allow to stand another 5-10 minutes. Peel the shells and quarter the eggs and keep aside. Heat oil in a heavy bottomed pan, once hot add in the chopped ginger, garlic, curry leaves and red chilli and fry. Add the chopped onions and fry until the onions are browned and well roasted. Add salt, pepper powder and the eggs, mix well to coat without seperating the yolks. Check for seasoning, mix in the chopped coriander, thai red chilli and serve. Boil the eggs , slit them into two halves. Heat oil in a pan , add in cloves and onions , saute till onions are soft , add in ginger garlic paste and saute for 2 minutes .Now add the tomatoes , and cook till it is soft. Add in tomato paste and the spices and fry for few minutes, Add the edamame , salt and mix them with the tomato mixture by adding little water .cover and cook for 10 minutes on medium flame . Now add in the eggs to the edamame mixture and carefully mix to coat with the edamame, without breaking the eggs. Garnish with corriander and serve.